We've probably all had a friend/acquaintance/person we stalked at some point in our life that we were interested in and said interest was not reciprocated. It can be a little bit...shall we say, torturous? Awful? Just plain stinky? Well, in my many years of expertise on the matter, and reading lots of books about things and stuff, and watching YouTube videos, I have developed a theory. Yep. I put physical attraction at the base. 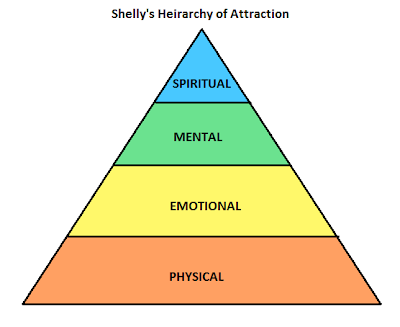 I did that because I believe it to be foundational to all the other types of attraction, albeit not the most fulfilling kind. Just like with Maslow's triangle, someone who is only eating, drinking, and sleeping isn't going to have a very satisfying life. So it is with physical attraction- It is only important so far as it opens the door to the other types of attraction. 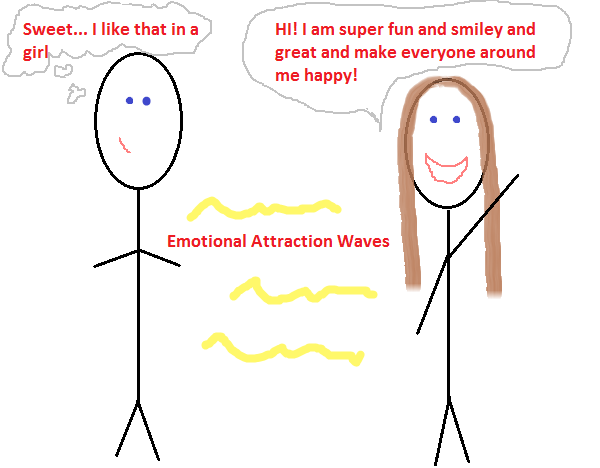 Emotional attraction has to do with things like personality, mood, and a person's social skills. These are things that you can see at the surface level and can sense about someone pretty quickly. Do they have a personality that you are drawn to? Yes? Okay, great. Next we have mental. This has to do with ability to communicate, to share ideas, and to feel intellectually stimulated by someone. We know that people tend to be drawn to those who are on the same physical attractiveness level as they are, and I believe this to to be true with intelligence as well. This is the equivalent of asking if you are attracted to someone's brain. In many cases I certainly am. And finally... spiritual. Now those of you who aren't religious, don't tune me out. Spiritual attraction is about shared ideals and beliefs, dreams, hopes, and aspirations. This allows people to progress together, and to reach things like self actualization. (See what I did there? You're welcome for the plug, Maslow.) This is the most fulfilling of all the types of attraction, it's the connection that makes you want to work and grow and progress together. Hip hip hooray if you reach this level! At this point I'm going to come back to the scenario I provided up at the top of the post. Go ahead, scroll up if you need to. Okay, ready? So you have this friend that you like, and they don't like you back. This is the case where even though you get along SO well, and have everything in common... it is likely that your foundation isn't there. And that doesn't mean that there won't be someone else who is totally into you and your look, it just means that this person isn't. And that's okay. When was the last time that you decided "I am choosing not to be attracted to this person"? Probably never, I would bet. Don't be upset if someone isn't into you, they likely can't do a whole lot about it, and what's worse than someone being mad at you for something you can't do much about? 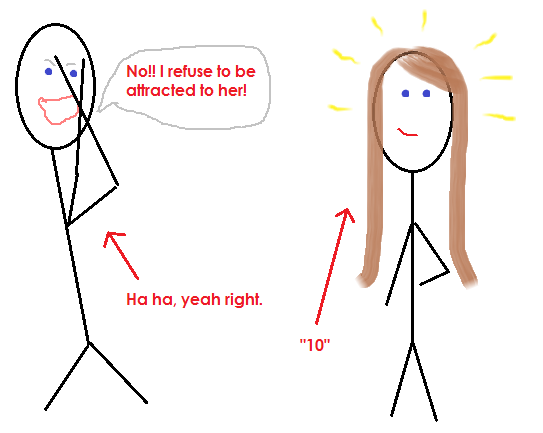 I will say that I do think that someone can move a couple notches up the attractiveness scale. Let's say you originally thought someone was a "five" and now that you've had fun with them, and seen how cool they are... they crept up to a "seven". I should note that this is the exception more than it is the rule (especially for guys, I don't think they "develop" attraction the same way that women can). If it's never happening at all for you, work on the bottom levels; if it's happening but never sticking, work on the upper levels.